Veteran wordsmith Gifted Gab and out-of-nowhere teen Lil Mosey look to capitalize on viral fame. The internet works in mysterious ways. It’s not always easy to predict what the link-clicking masses will catapult to viral sensation, beyond “totes adorbs” cat videos. But in recent months, digital lightning has struck for a pair of polar opposite Seattle rappers — one a Central District vet with paid dues, the other an unknown North End teen-turned-YouTube meteor — now trying to capitalize on the buzz. 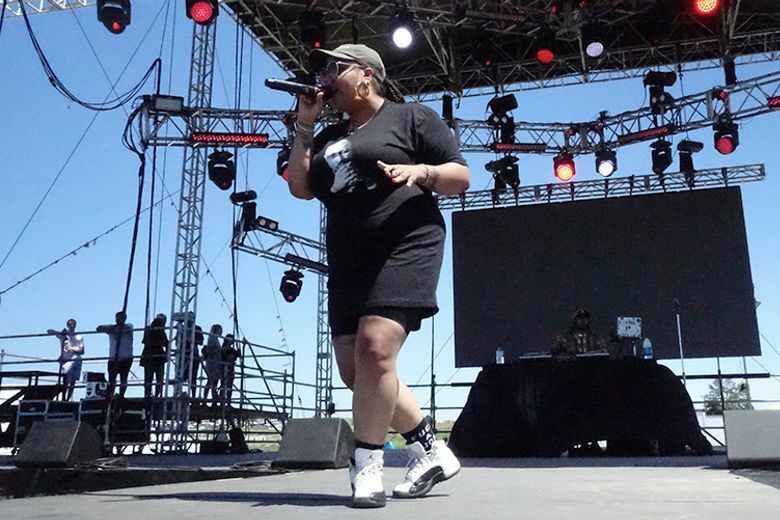 Local hip-hop fans are long familiar with Gifted Gab. The 27-year-old emcee has been grinding in Seattle for years, bringing her linguistic acrobatics to stages all over town, including the Fremont Abbey Arts Center this Saturday (8 p.m., $5-$13). Despite several locally acclaimed solo albums and national looks from XXL and Time magazines, it was a nonchalant, two-minute collaboration track with the Bay Area’s Blimes Brixton that became her unexpected breakout hit this year. “Honestly, it was so random,” says Gab from Los Angeles, where she’s been spending much of her time since the surprise digital fame. The two connected online and recorded the song “Come Correct,” just the second time they met in person, for a documentary Blimes was working on. It’s a short, chorus-free track of nonstop cypher-torching lyrical bombs primed to keep Wu-Tang buffs hitting the replay button. They quietly threw it online, though it didn’t get much traction until the since-minted duo dropped the video – filmed outside the Central District’s Red Apple grocery store shortly before its demolition — two months later. Gab says she’s not sure how it got on their radar, but media company Born Famous gave it its initial boost with a Facebook post viewed more than 5 million times. Other “like”-hungry blogs and social media accounts followed suit, and soon “Come Correct” racked up millions of more views, helping them land a deal with the same L.A.-based management company as Anderson .Paak, and sending Gab’s Facebook fan count surging from about 5,000 to 46,000. “We’ve been getting nonstop show and festival offers,” says Gab, who was subsequently added to Sasquatch! Music Festival and will bring their new B.A.G. (Blimes and Gab) group to Bumbershoot this fall. Their lyrically dense back-and-forth on “Come Correct” is a bit of a throwback compared to the type of woozy, SoundCloud-era tracks that have made young rappers like Lil Mosey internet famous virtually overnight. Despite being largely unknown in his native Seattle, Mosey’s lo-fi video for the accordion-laced “Pull Up” caught fire via the rap blog, Elevator, drawing more than 11 million views through its YouTube channel since December. In the absence of much mainstream media attention, Mosey’s primarily grown his fan base through SoundCloud and Instagram — venues where Generation Z increasingly anoints its new rap stars — with portraits of himself smoking weed and counting money in unconventional places (car hoods, a tarmac), earning tens of thousands of likes. (In another sign of his youthful appeal, Mosey only bothered creating a Facebook page in March.) This spring, he hit the road with Smokepurpp and fellow breakout teen Smooky MarGielaa respectively. Over the past two years, Gab had been considering leaving Seattle, and after spending much of this year in L.A., a permanent relocation there is in her near future. With Gab and Blimes each having solo records near completion, plus the upcoming B.A.G. record, Gab’s gearing up for what could be a pivotal summer, as they hatch a roll-out strategy for their various projects. While the viral fame hasn’t been a major cash cow (the biggest check she’s received from all those streams was around $700-$800), the biggest career change has been the freedom from making artistic sacrifices just to pay the bills.